Hurdon, Launceston | Launceston Then! Ancient Hurdon manor, Launceston, & Family connections. AD 1284: Under Edward I, Robert de Hurdyn held an acre of land and a bakehouse in the town of the Castle of Lanceveton, by the serjeantry [servitude] of being in the Castle with an iron helmet and a Danish hatchet [pole-axe] for forty days in the time of war at his own proper costs; and after forty days, if the Lord of the Castle chose to detain him in the same Castle, it was to be at the expense of the lord. Edward III, c1350. John de Medewell holds the Manor of Hurdyn. Feet of Fines: Fine No. 528 – 8 Edward iii. [25 Jan 1334 – 24 Jan 1335]. At York, 15 days from the day of St Michael, 8 Ed. iii. [13 Oct 1334]. Before William de Herle, John Inge, John de Stonore, Richard de Aldeburgh and William de Shareshull, justices. And afterwards 15 days from the day of St Michael, in the 10th year of the said King [13 Oct 1336] there granted and recorded before the aforesaid John de Stonore, William de Shareshull, John Inge, John de Shardelowe and Richard de Alderburgh, justices, and other, etc. Between Serlo Wyse, junior, & Isabella daughter of John de Trevaignon, claimants, and Serlo Wyse, senior, deforciant; as to 10 messuages, 2 mills, 4 ploughlands, 3 acres of meadow, 2 acres of wood & £4. 19s. 11½ d. rent & a rent of 8 sheep & 2 pairs of gloves in Trewandra, Beare, Strangetorre, Wadelond, Tregaller, Congo, Brokhol, Trenethlam, Pyderwyne, Trevosou, Trewalrat, Tremasrgh, Borlas Margh, Treworgas, Arlyn, Trelewyth, Kellygnohek, Tresaluester, Reswynyon, Tremen, Trebrunnek, Restallek, Penhelek & Borlas Burgeis. Plea of covenant was summoned. Serlo Wyse, senior, granted for himself & his heirs that 3 messuages, 2 mills, 2 ploughlands, 3 acres of meadow, 2 acres of wood, 40s. 4d. rent & the rent of 2 pairs of gloves in the said township of Trewandra, Beare, Strangetorre, Wadelond, Tregaller, Congo, Trenethlam, Pyderwyne, Trevousa, Trewalrat & Tresmargh, which Joan who was the wife of William Wise held in dower; and that 1 messuage & a moiety of 1 ploughland in the said township of Tregaller which the same Joan & Juliana de Tregaller held for term of life; and that 6 messuages, 1½ ploughlands in Borlas Margh & Borlas Burgeis which John son of Serlo Wyse, senior, held for term of life; and also that 59s. 7 ½ d. rent & the said rent of sheep in Treworgas, Arlyn, Trelewyth, Kelygnohek, Tresaluester, Reswynyon, Tremen, Trebrunnek, Restaek & Penhelek, which Thomas son of the same Serlo Wyse, senior, on the day this concord was made, and which after the death of the said Joan, Juliana, John & Thomas ought to revert to the said Serlo Wyse, senior, & his heirs, should then revert in its entirety to the aforesaid Serlo Wyse, junior, & Isabella, and the heirs of their bodies. To hold of Serlo Wyse, senior, & his heirs for ever. Rendering therefor yearly after the deaths of Joan & Juliana 1 rose at the feast of the Nativity of St John Baptist, and after the death of the aforesaid John to the said Serlo Wyse, senior, 60s., that is to say, one moiety at Easter & the other moiety at the feast of St Michael, and after the death of the aforesaid Thomas to the said Serlo Wyse, senior, 60s. at the same terms by equal portions. And also to the heirs of Serlo Wyse, senior, 1 rose at the said feast of the Nativity of St John Baptist for all service, custom & Exaction to the said Serlo Wyse, senior, & his heirs belonging. And rendering therefor to the chief lords of that fee for Serlo Wyse, senior, & his heirs all other services to the said tenements belonging for ever. And Serlo Wyse, senior, & his theirs shall warrant to Serlo Wyse, junior, & Isabella his wife the said tenements as is aforesaid against all men for ever. Should Serlo Wyse, junior, A Isabella die without heir of their bodies then the said tenements shall revert in their entirety to Serlo Wyse, senior, & his heirs quit of the other heirs of Serlo Wyse, junior, & Isabella. To hold of the chief lords of that fee by the services which to the said tenements belong for ever. For this Serlo Wyse, junior, & Isabella gave to Serlo Wyse, senior, £20 sterling. Fine No. 529. At York, 15 days from the day of St Michael, 8 Ed. iii. [13 Oct 1334]. Before William de Herle, John de Stonore, William de Shareshull, John de Canterbrigge, John Inge, John de Shardelowe, John de Trevaignon and Richard de Aldeburgh, justices, and other, etc. 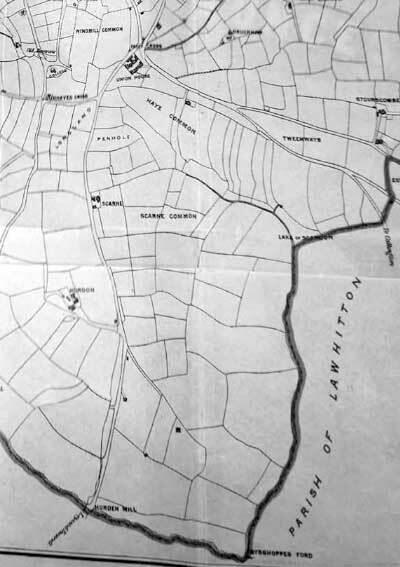 Between Serlo Wyse, senior & Matilda his wife, claimants, and Richard de Corynton, deforciant; as to 1 messuage, 1 ploughland, 5 acres of meadow, 40 acres of wood in Greyston & Loueleghe. Fine No.530. At York, 14 days from the day of St Michael, 8 Ed.iii. [13 Oct 1334]. Before [same as No. 529]. And afterwards, 15 days from the day of St Hilary, 9 Ed.iii [27 Jan 1334-5]. Before the aforesaid William de Herle, John de Stonore, William de Shareshall, John Inge, John de Shardelowe, John de Trevaignon and Richard de Aldeburgh, justices, and other, etc. Between Serlo Wyse, senior, claimant, and Richard de Corynton, deforciant; as to the manor of Bentewyn & 2 messuages, 1 ploughland, 2s. 9d. rent, & a rent of 1 pound of cumin in Hextaworthy, Tresmargh, Trenalt, Drenek, Trevousa, Bardon & Tregellest. Plea of covenant was summoned. Serlo acknowledged the manor and tenements to be the right of Richard as by gift of Serlo. For this Richard granted them to Serlo & gave them up to him at the Court. To have and to hold to Serlo during his life of the chief lords of that fee by the services which to the said manor belong. After the death of Serlo the manor and tenements shall revert in their entirety to Serlo Wyse, junior, & his heirs ha shall have begotten on Isabella daughter of John de Travaignon. To hold of the chief lords of that fee by the services which to the said manor & tenements belong for ever. Should Serlo, junior, die without heir by Isabella the manor & tenements shall revert in their entirety to the right heirs of Serlo Wyse, senior. To hold as aforesaid for ever. Pentuan – in St Austell; Hexworthy – in Lawhitton; Tresmarrow, Drinnick, Trevoza, Burdown – in South Petherwin; Trenalt – in Trewen; Tregellast – in St Keverne. Fine No. 624 vol. 1. At Westminster, 1 month from Easter day, 38 Ed iii [21 April 1364]. Before Robert de Thorp, John Moubray, John Knyvet and John Delves, justices, and other liegemen of our lord the King. Between Richard Seke & Alice his wife, claimants, and John Mareys, parson of the church of Northille & Robert Seke clerk, deforciants; as to 2 messuages, 1 mill, 1 ploughland, 8 acres of meadow, 60 acres of furze in Hurdyn next Launceston. Plea of covenant was summoned. Richard & Alice acknowledged the tenements to be the right of Robert. Of which Robert & John have 2 parts by gift of Richard & Alice. For this John & Robert granted the said 2 parts to Richard & Alice and gave them up at the Court. To have and to hold to Richard & Alice & the heirs of their bodies of the chief lords of that fee by the services which to those 2 parts belong for ever. Moreover John & Robert undertook for themselves & the heirs of Robert that 1/3rd part of the said tenements which William Smyth & Matilda his wife held as Matilda’s dower of the inheritance of the said Robert in the said township on the day this concord was made & which after Matilda’s death ought to revert to the said John & Robert & the heirs of Robert should then revert in its entirety to Richard & Alice & their aforesaid heirs. To hold together with the said 2 parts which remain to them by this fine of the chief lords of that fee by the services which to that 1/3rd part belong forever, Should Richard & Alice die without heir to their bodies then the tenements shall revert in the entirety to the right heirs of the said Alice. To hold as aforesaid for ever. Folio 21, February 2nd. London, 1352: Instructions to John Dabernoun, steward & sheriff, and John de Kendale, receiver of Cornewaille, in regard to the following matters, upon which agreement has been reached by the prince and his council:- In the matter of the mills of Lostwithiel, the fishing of the water of Fawy, and the court called the plea of fishing, which have been at farm and are now in the prince’s hand;  inasmuch as the watercourse which used to run to the mils is practically destroyed, and the fishery ruined, by certain tin-workers who work in the moors of Glyn and Redwith, it is necessary to acquire a watercourse through the meadows of Jeoce Marchant and Richard Page, burgesses of Lostwithiel. They are therefor to acquire the said meadows as profitably as possible, make a weir at the mills for the said watercourse, and cause tin-workers to be removed utterly. In the matter of the arrears of 12l. which are still due to the prince in the hundred of Estwyvelshire from the time when William Trethewy was farmer there, they are to distrain Serle Wise, who is bailiff in fee of the said hundred, both in his manor of Grayston and elsewhere, until the said 12l. be fully paid. In the matter of the arrears which are due to the prince from the time when Sir Robert Beaupel was sheriff and receiver in Cornewaille, [which arrears were taken upon himself by Michael Wastel and great part thereof paid, but he has become so poor that he can pay nothing more, while of his debtors some are dead and the rest so impoverished that they pay nothing, and his bonds have been delivered to John de Kendale], they are to distrain the heirs and executors of Sir Robert, the principal debtor, by their land and goods, unless they can shew cause why they ought to be discharged thereof. Whereas the town of Excestre is bound to the prince in a fee farm of 20l., and if the same is in arrear the prince’s receivers of Cornewaille ought to take distresses throughout the town, wherever and from whomsoever they think the money can most speedily be levied; they are to distrain for the said rent, as above, whenever necessary. Whereas the water of the Tamer is the prince’s several water, and is held of his castle of Trematon for 1½ knight’s fees, and no man ought to make a weir or fish therein without warrant, and whereas the abbot of Tavystok has made a weir called ‘Overhacche’ in the said water within the prince’s manor of Calystok, and take great abundance of salmon there; they are to distrain the abbot to shew by what title he claims the fishery, and certify the prince himself thereof, and if he has nothing to say for himself, but has it by encroachment, they are to remove him utterly there-from. Whereas the grass of the lawns within the prince’s park of Rostermel is overgrown with moss because the lawns have long lain uncultivated; they are to lease the lawns by the acre to tenants and others as profitably as possible, and for such time as they shall think necessary for their cultivation. Folio 50, Feb 4th, 1354: Berkhampstead. Order to Richard de Eleford, steward and sheriff of Cornewaille,- on representations by Richard Seke & Alice his wife, & Eleanor, sister of the said Alice, that whereas the said Alice & Eleanor, who are daughters & heirs of John de Medewill, and their ancestors time out of mind have held in socage of the prince and his progenitors an acres of land Cornish in Hurdyn, doing suit therefor every three weeks to the gate of the castel of Launcevetone, and paying 12s. 6d. for relief, the prince’s ministers in those parts have newly distrained the said land for 18d. of rent in addition to the ancient services,- to make diligent inquisition touching the said matter by the most worthy men of those parts, taking good care always that, if the prince have right to the rent so demanded, he be not cheated thereof by such inquisition. He is to certify the prince of the result of the inquisition by the quinzain of Easter next. By bill endorsed. September 26th: Plympton. Order to the auditors of the account of John de Skirbek, late keeper of the prince’s fees of Cornewaille & Devenshire, – in pursuance of divers inquisitions taken before Robert Eleford, the steward, the said John and the auditors, shewing that John de Mandevill, father of Alice, the wife of Richard Seek, and Eleanor, her sister, and all her ancestors tenants of an acre of land Cornish in Hurdyn, held the said land of the prince and his progenitors and predecessors, earls of Cornewaille, in socage, by suit of court at the gate of the castle of Launceveton every three weeks and by a relief of 12s. 6d. for all rents and services, – to discharge the said feodary, or any others of the prince’s ministers whom they may charged with other rents and services, if they think they ought in reason to do so. 1357. Feb 13th. London: Folio 70 – Order of the prince’s clerk, Sir William de Sprydlyngton, one of the auditors of accounts of the prince’s ministers, on taking the account of John de Skirbek, Keeper of the Fees of Cornewaile and Devenschire, to respite until the quinzaine of Michaelmas next the yearly rent of 18d which is current in demand against Richard Sek and Alice, his wife, for certain lands in Hurdyn which are held of the prince in chief. Order, also, – on a request to the prince that he will lease at farm to John Durant, a minor in his ward, the moiety of the manor of Alet which is in his hand by reason of the minority of the said John, for as long as it shall remain in his hand, at a rent of as much as would be given by anyone else, – to allow the said John to have at farm on the above terms the things which are in the prince’s hand by reason of his minority. By testimony of the Bishop of Wyncestre and by advice of the members of the council, at the suit of John Tremayn. Order to John Skirbek, keeper of the prince’s fees of Cornwaille and Devenshire not to distrain the said Richard & Alice for the above rent of 18d. between now and the quinzaine of Michaelemas next, and to release on sufficient security until that date any distress already take from them. By testimony etc. as above. July 12th. 1357. Westminster. Folios 76/77: Order to the same by advice of the prince’s council,- inasmuch as Richard Sek and Alice, his wife, and Eleanor, Alice’s sister, [the said Alice and Eleanor being daughters and heirs of John de Medewell], have long sued to the prince and his council for their discharge from a rent of 18d which is demanded of them in the prince’s name for certain lands in Hurdyn, over and above the services due and accustomed, to cause search to be made of the accounts of the prince’s ministers of those parts, and any other evidences concerning this matter, and to do right to the complainants, if possible without taking an inquisition. If an inquisition is necessary they are to take one and do right and reason in accordance with the finding thereof, without troubling the prince’s council further therein. September 8th. 1359. London: Order to the said steward and sheriff, and John de Skirbek, keeper of the prince’s fees in Cornewaile, – in pursuance of divers inquisitions taken before Robert de Eleford, late sheriff of Cornewaile and the said John, as well as before auditors of the accounts of the prince’s ministers, showing that John de Medewell, father of Alice, the wife of Richard Seek and Eleanor, her sister, and all his ancestors tenants of an acre of land Cornish* in Hurdyn, held the said land of the prince and his progenitors and predecessors, earls of Cornewaile, in socage, by suit of court at the gate of the castle of Launscavetone every three weeks, and a relief of 12s 6d for all manner of rents and services, – not to distrain the said Richard, Alice, Eleanor, now tenants of the said lands, to do or pay any other services or rents than the above. September 26th. 1362. Plympton. Order of the auditors of the account of John de Skirbeek, late keeper of the prince’s fees of Cornwaile and Devenshire, – in pursuance of divers inquisitions taken before Robert Eleford, then steward, the said John, and the auditors, shewing that John de Medewill, father of Alice, wife of Richard Seek and Eleanor, her sister, and all his ancestors tenants of an acre of land Cornish in Hurdyn, held the said land of the prince and his progenitors and predecessors, earls of Cornewaile, in socage, by suit of court at the gate of the castle of Lanscavetone every three weeks and by a relief of 12s 6d for all rents and services, – to discharge the said feodary, or any others of the prince’s ministers whom they may have charged with other rents and services as due to the prince on account of the said land, of such rents and services, if they think they ought in reason to do so. Licence Celebrandi: 10 April, 1425 [Lawhitton] . . . . also to Richard Pentere. Joan his wife and John his son, to hear divine service in a chapel in their howse at Hurdon. Lyson’s Bibliothica, 1814: “The Barton of Hurdon, near the town of Launceston, formerly esteemed a manor, was the property of John Carpenter, Esq., now, by purchase, of Edward Coode, Esq. The mansion is occupied as a farm house. Western Antiquary, vol.7. p.83/4: A Cornish Volunteer Commission in 1808. By Richard Earl of Mount Edgcumbe, Viscount Valletort, Baron Edgcumbe of Mount Edgcumbe in the County of Devon, Lord Lieutenant of the County of Cornwall. SEAL To – David Thompson Gentleman. I the said Richard Earl of Mount Edgcumbe, do in His Majesty’s Name, by these Presents, Constitute, Appoint and Commission you the said David Thompson to be Ensign in the Corps of Launceston and Newport Volunteer Infantry but not to take Rank in the Army, except during the Time of the said Corps being called out into actual Service; You are therefore carefully and diligently to discharge the Duty of an Ensign by exercising and well disciplining both the inferior Officers and Soldiers of that Company whereof [ blank left unfilled] is Captain, who is commanded in his Majesty’s Name to obey you as their Ensign and you are to observe and follow such Orders and Directions, from Time to Time, as you shall receive from His Majesty, your Lieutenant Colonel or any other your superior Officer, according to the Rules and Discipline of War, in Pursuance of the Trust hereby reposed in you. Given under my Hand and Seal the 6 Day of January in the Forty Eighth Year of our Sovereign [sic in orig.] Lord George the Third, by the Grace of God of the United Kingdom of Great Britain and Ireland King, Defender of the Faith, and in the year of our Lord one Thousand eight Hundred and eight. Mount-Edgcumbe. On August 9 in the same year Ensign Thompson was promoted by Lord Mount Edgcumbe to be “Lieutenant in the Corps of Launceston and Newport Volunteers,” the terms of the Commission being precisely similar to those given above, save that, instead of the name of the Captain being left blank, the place referring to the captaincy was altered in writing to “that Company to which you shall be appointed”. It would thus be indicated that the office was vacant at that period, but any information concerning this corps would be welcome. 1794 15 May: John Thompson son of David & Hannah, farmer. 1797 6 Dec: Mary Sarjeant Thompson dau of David & Hannah, surgeon. Lezant Registers: Marriage: 2 July 1857: George Sargent Sargent, frmr, Bottonett, son of George Sargent, yeoman, and Hannah Jane Thompson, Hurdon, St Mary Magdalene, dau. of David Thompson, yeoman. Thompson, David, Esq. of Bagbury Farm, Stratton – married 7 December 1819 at Lanteglos, Camelford, to Miss Nancy Meake, of St Teath. From ‘Cornish Gentlemen’: Thompson, David [son of David Thompson, born Trewarlett in Lezant 20 Oct. 1785, died Bottonnett, Lezant, 1 Feb 1873. married Nancy, dau of Nicholas and Ann Cole Male*. She was born Trehannick in St Teath 2 Jan 1791. died Bottonnett 18 Jan 1864]. Born at Hurdon in Launceston Parish 24 May 1832. baptised Wesleyan Chapel; Educated at Bellevue, Launceston and Bideford grammar school; of University of Edinburgh. LRCS 1854; LSA 1855; LRCP Edinb by exam 1870; President Hunterian Medical Society, Edinburgh 1853-54; Deputy Coroner of county Cornwall 1866; Assistant Surgeon, Staff 2nd Battalion Duke of Cornwall’s Rifles 1875; married 7 February 1856 at Liskeard Parish Church, Elizabeth, daughter of Rev. William and Martha Fookes. She was born Liskeard 13 December 1826. Diphtheria or diphtheritic. British Medical Journal 1858. pp. 449-50. President’s address to the south western branch of the British Medical Association at Launceston 20 June 1866. ib. i, 73-74 . Thompson, John [brother of David Thompson]. Born Leigh House, Stratton, 7 October 1820. Of University College; MRCS and LSA 1842; of St Andrew’s MD 1862; FRCS, Eng, exam 1863; Fell. Obstr. Soc. London; Member Harverian Society; JP for Borough of Bideford; Coroner for Bideford. Foreign bodies in the ear. British Medical Journal, i, 596 . Foreign bodies on the surface of the eye. ib. ii, 231-32 Paraphimosis. ib. ii, 363-64. Corporation: David Thompson, Esq. Mayor. Aldermen: David Thompson, Esq., George Graham White, Esq., Joseph B Geake, Esq., John Ching, Esq. Borough Magistrates: The Mayor and ex-Mayor for the time being. Cornish & Devon Post, 1 July 1882: Mr William F Thompson, of Southgate Street, Launceston, and son of Dr Thompson, has passed the final examinations at the University of Edinburgh for the double qualification of Batchelor of Medicine and Master in Surgery. 1794 15 May John Thompson son of David & Hannah, farmer. 1797 6 Dec Mary Sarjeant Thompson dau of David & Hannah, surgeon. In 1883, Kelley’s Directory for Launceston carries the following information: Thompson, David, LRCP. Edin., physician and surgeon, medical officer & public vaccinator No 3 District, Launceston Union, Southgate St.
January 3rd, 1885: [C&D Post] – Little Hurdon, Launceston. To Let by Tender from Lady-Day next, a small farm, about 24 acres, with Dwelling House and suitable Out-Buildings; about 1.1/2 miles from Launceston. For particulars apply to R Gubbin, Hurdon, Launceston, to whom Tenders should be sent on or before the 24th inst. The Highest or any Tender not necessarily accepted. April 10th, 1885: HURDON SALE: Sale by Messrs R & RF Gubbin of All Live and Dead Stock. In 1889, William F, son of David, is described in the local directory as: William Fookes Thompson, MB, Edin. Physician & surgeon, medical officer & public vaccinator for the No.2 District, Launceston Union. A daughter was born to Dr. William and Mrs Harriet Thompson on 23rd June, 1892, when they lived at Riverside, St Thomas, Launceston; she was christened Harriet Dorothy Margaret, grand-daughter of Dr. and Mrs. David Thompson. DATED 15th January 1895. Mr Alexander Fraser to Mr David Thompson: Mortgage of Dwellinghouse Shop and premises in Broad Street, Launceston, Cornwall to secure £900 and interest. This Indenture made the fifteenth day of January One thousand eight hundred and ninety five Between Alexander Fraser of Broad Street Launceston in the County of Cornwall Draper of the one part and David Thompson of Launceston aforesaid Physician and Surgeon of the other part Witnesseth that in consideration of the sum of Nine hundred pounds paid to the said Alexander Fraser by the said David Thompson on or before the execution of these presents [the receipt whereof the said Alexander Fraser hereby acknowledges] the said Alexander Fraser hereby covenants with the said David Thompson to pay to him on the fifteenth day of July One thousand eight hundred and ninety five the sum of nine hundred pounds with interest thereon in the meantime after the rate of four pounds ten shillings per cent per annum computed from the date of these presents and also so long after that day as any principal money remains due under these presents to pay to him interest thereon after the same rate by equal half yearly payments on the fifteenth day of January and the fifteenth day of July Provided Always that if and whenever a half years interest for the said principal sum of Nine hundred pounds at the rate of four pounds per cent per annum shall be paid upon the half yearly days hereinbefore appointed for payment of interest or within thirty two days thereafter, the same shall be accepted in lieu of and in satisfaction for the interest after the rate of four pounds ten shillings per cent per annum payable for that half year under the foregoing covenant in that behalf but no claim for reduction shall be made within the time aforesaid AND This Indenture Also Witnesseth that for the consideration of aforesaid the said Alexander Fraser as beneficial owner hereby conveys unto the said David Thompson All that Dwellinghouse Shop hereditaments and premises being on the Southern side of the Broad Street in the said Borough of Launceston near the site of an ancient Fish Market there, the said having been for many years in the occupation of Messieurs Fraser and Gardener as Drapers but now and for some time past in the occupation of the said Alexander Fraser and which said premises are bounded on the North by the Broad Street, on the South by the property of the late John Ching, on the East by the property formerly belonging to and occupied by Richard Robbins but now in the occupation of Thomas Smale and on the West by the properties of the late Thomas Shearm and John Ching TO HOLD the same unto and to the use of the said David Thompson in fee simple Provided Always that if the said sum of Nine hundred pounds with interest thereon shall be paid on the fifteenth day of July One thousand eight hundred and ninety five according to the foregoing covenant in that behalf, the premises shall at the request and cost of the said Alexander Fraser his heirs or assigns be reconveyed to him or them And the said Alexander Fraser hereby covenants with the said David Thompson that he the said Alexander Fraser his heirs and assigns will at all times during the continuance of this security keep the Messuage and buildings comprised herein insured in the Phoenix Fire Office or in some other Insurance Office approved by the said David Thompson his executors administrators or assign and will on demand produce to him or them the Policy of such Insurance and the receipt for every premium payable in respect thereof AND it is hereby declared that no Lease made by the said Alexander Fraser his heirs of assigns of the said premises or any part thereof during the continuance of this security shall have effect by force or virtue of Section 18 of the Conveyance and Law of Property Act 1881 unless the said David Thompson his executors administrators or assigns shall consent thereto in writing IN WITNESS thereof the said parties to these presents have hereunto set their hands and seals the day and year first before written. the presence of – Mr Graham White, Soltr, Launceston. 1897 January 18th – Received the sum of One Hundred Pounds on account of the Principal sum due on within Mortgage – David Thomson. Jan 18 1897. David Thompson, Esq. Southgate House, Launceston. Post & News & East Cornwall Times, January 5th, 1895: TO BUILDERS.Tenders are invited for BUILDING a NEW SLAUGHTER HOUSE, and a Wing to the Dwelling House at Hurdon Down, near Launceston, in the occupation of Mr Dennis. Plans and Specifications may be seen at the offices of M/s. Kittow, land agents and surveyors, Launceston, who will receive Tenders until 12th January next. In 1895, desiring a larger residence for his family, and with more room to practice his calling, Dr William Fookes Thompson employed local architect, Otho B Peter, Esq. to design for himself a new residence in the Roydon Road, in the parish of St Stephens-by Launceston. This was to be named ‘PENQUITE’. Mr Peter’s advertisement in the local weekly newspaper read: TENDERS invited for the Erection of a Residence, Stable buildings, Boundary Walls, &c. on a site adjoining Roydon Road, St Stephens, for Dr WF Thompson. For Plans and Specifications apply to Mr Otho B Peter, architect, Northernhaye, Launceston. dated: Launceston 21 May, 1895. By 1897, Dr William Thompson had joined his father and Dr. Gibson, as partners: Thompson, Thompson & Gibson, physicians & surgeons, Southgate Street, Launceston & Penquite, St. Stephens. 1906: Thompson, David, LRCP & LRCS Edin, Medical officer & public vaccinator for No 3 district & deputy county coroner, Dunstowe, Dunheved Road. 1914: Mrs Thompson, Dunstowe, Dunheved Road. 1914 -1926 – 1927 – 1930: David Fookes Thompson, JP., MD., Penquite, Roydon Road. Partner in Thompson & Gibson, physicians and surgeons, Southgate Street, Launceston. Mayor of the Borough of Launceston 1916 – 1918. In October of 1916, Dr William was appointed Mayor of Launceston, after becoming a Town Councillor in March, 1911; when he retired by rotation in 1913, such was his popularity that he was returned unopposed. As a devout Church of England supporter, Dr Thompson was a Lay-reader at St Stephens Church and was appointed Peoples Warden in 1916. At his father’s death he was appointed County Coroner for the Launceston Division. Dr and Mrs Thompson’s only daughter, Harriet, also – with full support and encouragement of her parents – joined the VAD at Launceston, working in the hospital until she was sent to a hospital at Brighton, in 1918. C & D Post 21 10 1916: Launceston’s New Mayor. Dr. “Willie” Thompson. It is not surprising that the present Mayor of Launceston, after four years of hard public service in that office should have declined the invitation of the Council to undertake a fifth term. Mr Hicks is entitled to enjoy the fruits of a well-earned retirement from the ‘fierce light’ that beats about the mayoral throne; and the good wishes of us all will follow him into his retirement. We are glad to know that we are not to lose him from public life. He will remain for many a long year, as we trust, a member of the Council. We congratulate him upon the perfect record he had made of attendance at the Council and committee meetings. He has not missed one single attendance during his four years of office. The council are to be congratulated on their success on finding so eligible a successor to his present Worship as Dr William Fookes Thompson. In him we feel sure we shall have a hard-working exemplary mayor, who will be worthy of his predecessor. Dr Thompson has won the esteem, we may almost say, the affection of his colleagues of the Council, whose invitation to him to become chief magistrate of Launceston was as hearty as it was unanimous. The general public are grateful to him, not only for his earnest public work, but also for the skill, assiduity, and gentleness which he ever shows in his ministry of healing. Dr Thompson was first elected a member of the Town Council at a bye-election in March, 1911, at the time of the elevation of Councillors Kittow and Reed to the aldermanic dignity. There were three vacancies; and Dr Thompson came in at the head of the poll. When he retired by rotation in 1913 such was his popularity that he was returned unopposed. He was due to retire again this year but for the suspension of elections owing to the war. He is Chairman of the Municipal Buildings Committee and a member of the Museum Committee. Dr Thompson had rendered good service to this town for several years as chairman of the local gas company in succession to his father. Not so long since, his loyal service to the Unionist Party was recognised by his unanimous election as President of the NE Cornwall Unionist Association, in succession to the late Mr Digby Collins. A devout son of the Church of England, Dr Thompson is lay-reader at St Stephens’ Church, where he was appointed people’s warden last Easter. Since his father’s death, he has been County Coroner for the Launceston Division, and we all know the painstaking care which he exercises in fulfilling the duties of that ancient office. During the war Dr Thompson has rendered valuable service as chairman of the local recruiting committee that sat in the days of Lord Derby’s appeal for volunteers. Further, Dr and Mrs Thompson – who is a member of a Fowey family – have done active work in connection with the Red Cross VAD Hospital and Soldier’s Recreation Room. It is a joy to see our friend following in the footsteps of his late revered father – Dr David Thompson – who was Mayor of Launceston in 1877-8 and again in 1887-8. In the same edition: “Miss Thompson’s Death. Great sympathy with the Mayor and Mayoress. The residents of the borough of Launceston have extended very real sympathy to the mayor and mayoress in the death of their only daughter, at the early age of 26 years. At the outbreak of war Miss Thompson enrolled as a helper in the Launceston V.A.D. Hospital, and while engaged as a nurse in a Brighton hospital some months since, she had a serious breakdown in health. Nurse Thompson came home to die. She had thus virtually given her life for her country. Her remains were laid to rest in St Stephen churchyard on Wednesday afternoon. There followed a long list of mourners- family, servants, Councillors, etc. The bearers were members of the St John Ambulance and British Red Cross Society, and former orderlies at the VAD Hospital, comprising – Messrs: JR Quick, SC Mutton, LP Symons, AS Keat, WH Philp and WT Mills; with Mr CS Atkins in charge. Rifleman G Wicks, Croix de Guerre, blew ‘Last Post’. Directory 1923: Penquite, St Stephens – Thompson, William Fookes, MD. JP. Directory 1930: Penquite, Roydon Road – Thompson, William Fookes, MD. JP. Directory 1935: Penquite, Roydon Road: THOMAS PERCY FULFORD – Mayor of Launceston 1949-1950. Directory 1938: No 1, Roydon Road – Fraser, Mrs DS. No. 2, Roydon Road – Fulford, TP. Directory 1956/7: Uglow, SE, Penquite, Roydon Road. Miss Thompson’s remains are in the family tomb, near the door of St Stephens Church. Directory 2002: Penquite House, No. 1. Roydon Road: Penno [Mrs] PJ. Ann Male Thompson, Launceston. 18 March 1846; aged 21. John Thompson, St Thomas. 14 March 1865; aged 71. In the Congregational Church burial ground at the bottom of ‘Old Hill’, is the grave of David Thompson, of Hurdon Farm. The large tombstone appears to be now beneath the raised ground to be used as parking for the new flats. Other Thompson graves are nearby, also desecrated and lost to view. Dr WF Thompson sustained a severe shaking and bruising on Saturday when he fell from his cycle at North Petherwin. The Poor Rates for Launceston. 9 October, in the 19th year of the reign of His Majesty King George the Third, One thousand Seven hundred and Seventy-nine. “If that old Scarne income which has been wandering about for years, really belongs to the poor, the poor ought to have it. It may be said it comes to the same thing to put it in the borough exchequer in relief of rates; but it is not quite the same thing: for the borough rate is not the local poor-law union, though part of it. An article from the Cornish & Devon Post, dated 1st April, 1944, which is headlined “Pages from Lanson’s Past,’ and was written by the Lanson Borough Collector of Rates & Accounting Officer, Mr AE Jones, in which he says he had discovered the Rates Book for the period 1779 to 1798, and from which he quotes various bits of history regarding payments, names, and other valuable details. I have put together a fair history of the two largest rated properties, Hurdon Farm and Scarne Farm, but had no idea of the following regarding Scarne. I quote: “I should like to record here the fact that the owner of Scarne Farm is liable to the Borough for the payment of £25 yearly reserved in, and by an Indenture dated 2nd May, 1757, for 500 years from that date. I know that most of the older charities have been absorbed into accounts for general charities and gifts, copies of which used to be kept in our library. Those copies must now be in either the records office or the Central Library. I do not know if the Scarne Poor Charity was absorbed in something similar, or has been kept separate as another part of the rates system. Indenture regarding Scarne Farm, dated 2 May, 1757, and the sum of £25 annually for 500 years. CRO: B/Launs/329 and FS/3/1195 – 1932- refer: Lease – 5 April 1756, etc. Coryndon Carpenter, attorney, mayor, – very long and ancient family. Part of Mr R Robbins lecture of Monday 24th November, 1884: “In the latter part of the last century Wind Mill was the property of the poor of this Parish. In 1770 the Corporation, who were the custodians of the property, represented that it was of no benefit to the poor, and no use whatever being made of it, an Act of Parliament was obtained empowering them to sell it. It was sold for a small sum of money to a Mr Frost. The money was invested in Consols, the interest to go for repairing the Church and lighting and repairing the streets; but I cannot recollect that the town has had any benefit from it for the last thirty years. This should be seen into. A few years ago the representatives of the gentleman who bought Wind Mill sold it again and made something over £4,000 of it. In 1775 the Government also obtained an Act for the disposal of Scarne [which also belonged to the poor], the Corporation representing to the Lords of the Treasury that no benefit accrued to the poor from it whatever. A ready purchaser was found in Mr John Pearse, innkeeper of the town, for £25 per annum for 500 years, the vendors reserving to themselves the right to the timber grown on the estate. Page 232 of ANNO REGNI VICEIMO QUARTO – part of the original document in CRO: FS/3/1195/2. – – to transfer the said Bank Annuities into the Names of the Mayor and Aldermen of the said Borough; and the said Mayor and Aldermen shall, and are hereby required, or before the Twenty-fifth Day of December, One thousand seven hundred and eighty-four, to transfer the said Bank Annuities into the names of the Guardians appointed in and by virtue of this Act; and it shall be lawful for the said Guardians to sell and dispose of the same, or any Part thereof, and the Money arising thereby shall be applied in the Payment and Discharge of the Debt so incurred as aforesaid, and if there shall be any Surplus, the same shall be applied towards the Maintenance and Employment of the said Poor; and in the mean Time, and until such Sale, the said Guardians shall receive the Interest or Dividends of or upon the said Bank Annuities, and apply the same in like Manner as the said Surplus is hereby directed to be applied; but in case the Money arising by the Sale of the said Bank Annuities shall not be sufficient to discharge the said Debt, the Deficiency shall be made-up by a Rate, to be laid as herein after is mentioned. VII. And Whereas there are, within the said Borough, several Common Lands, called Great Pennygillam, Little Penygillam, Hay, Windmill, and Longland, the Aftermowth of which hath of ancient Right and Custom, for Tome immemorial, belonged to and enjoyed by the Mayor, Aldermen, and free Burgesses of the said Borough, and the Widows of deceased free Burgesses, for depasturing all cattle [except Hogs] from the Time of the several Crops of Grass and Corn are removed, to the Twelfth Day of January in ever Year; but, for Want of proper Regulations, the said Depasturage produces very little Benefit or Advantage to the several Persons entitled thereto; be it therefore enacted, That, from and after the passing of this Act, all the Aftermowth or, or Right of depasturing Cattle on the said Common Lands, shall be, and is hereby vested in the Mayor and Aldermen of the said Borough for the Time being forever, free from all Right and Claim of Common or Pasture, by the Mayor, Aldermen and free Burgesses of the said Borough, and the Widows of free Burgesses; in Trust nevertheless to sell and dispose of the said Aftermowth of Right of Depasturage, or otherwise to lease or demise the same, by Writing, to any Person or Persons, for best Price or Rent that can Reasonably had or obtained for the same, [giving Preference in such Sale to the Proprietors of the several Pieces of Land within the said Common Lands], and to apply the money arising by such Sale or Rent, from Time to Time, in Manner following; [that is to say], in the first Place, in making Satisfaction and Compensation to such Persons, for their Right and Interest in the said Aftermowth or Right of Depasturage, as shall claim and demand the same; and the Remainder of the Money arising from such Sale or Rent to be applied towards repairing the Church, repairing and lighting the Streets, or any other Purpose, for the Ornament of the said Town, or the Convenience of the Inhabitants. David, jnr. son 9 born Hurdon 24 May, 1832. David Thompson GP 28 Launceston. Margaret dau 1 St Thomas. John Lane 17 carter Jacobstow. * Nancy & Gertrude sisters. 1881 Census. 23 Forrest Road, New Greyfriars, Edinburgh. and GP; Coroner for Bideford Launcells, Cornwall. Notes: Messuage – Dwelling & offices with the adjoining lands appropriated to the household: a Mansion House and grounds. Deforce – to keep out of possession by force. Deforciant – one who deforces. Fealty – the vassal’s obligation of fidelity to his feudal lord. Claimant – one who makes a claim. Socage – tenure of lands by service.